Yesterday, we Family Tree Magazine editors got to thinking about just how big the Family History Library‘s collection is. I don’t even know what inspired us, but we wonderedwould the FHL’s microfilm reach to the moon? The FHL has 2.4 million rolls of microfilm. A microfilm box is about 4 inches wide. A mile is 63,360 inches, and the FHL’s got 9.6 million inches of microfilm boxes, assuming they’re all a standard size. Laid end to end, those boxes would stretch about 151.5 miles. So you could get from Salt Lake City nearly to Pocatello, Idaho, on the FHL’s microfilm boxes. Or from Indianapolis to Gary, Ind., or if they were in Texas, from Fort Worth to Abilene. Photo from The Queen’s University Library. This entry was posted in FamilySearch, Genealogy Fun, Genealogy Insider. Bookmark the permalink. No! Don’t measure the microfilm BOXES, measure the length of a roll of microfilm! We want to know the number of FEET of microfilm (okay, others in the world will want to know meters) and how far that will take us to the moon. So how long is a roll of microfilm? 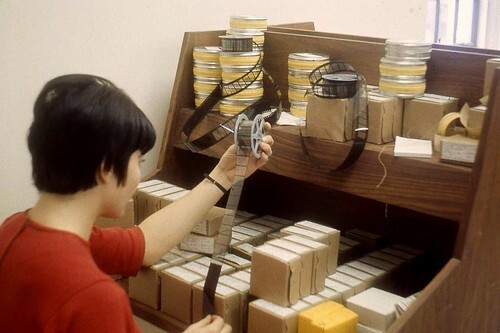 If a standard roll of microfilm is 2000 feet, I think you’ve got about 909,000 miles of film there… that’s almost enough to go the 238,857 miles to the moon and back — TWICE. Hi! Congratulations on starting your blog, Kathryn! I can’t claim to have done the math here–that was our assistant editor, Grace. I have to admit we took the easy way out and measured the boxes, since there’s no telling how long each reel’s film is. Unless the FHL keeps track–anyone know? Or maybe someone could average the diameter of a bunch of rolls and come up with a formula for film length based on that? Jeff, how did you arrive at 2,000 feet per roll?